The National Interagency Fire Center in Boise announced Thursday that top fire managers representing various U.S. Wildland Fire agencies requested about 70 fire managers and specialists from the two countries. With the nation still at wildfire preparedness Level 5 — the highest there is — and spending $ 150 million per week fighting fires, Australia and New Zealand are sending firefighters to help battle wildfires burning in the western United States. The United States has also sent its own firefighters to these countries when they need aid: 67 to Australia in 2007 and 73 in 2009. Details are still being worked out, but the firefighters are expected to arrive in Boise on Sunday. After a one-day orientation to learn about current fire behavior they will be assigned to large fires. The last time the U.S. asked for help from Australia and New Zealand was in 2008. Boise, Idaho – Top wildland fire managers at the National Interagency Fire Center (NIFC) in Boise, Idaho are mobilizing firefighters from Australia and New Zealand to assist with wildfire suppression efforts in the western United States. Australia and New Zealand have been key partners with the U.S. fire community for more than 50 years but were last mobilized in 2008 when severe fire activity was similar to this year. The National Multi-Agency Coordinating Group (NMAC) comprised of top fire managers representing the Bureau of Land Management, Bureau of Indian Affairs, the National Park Service, and the U.S. Fish and Wildlife Service, the U.S. Forest Service, the U.S. Fire Administration and the National Association of State Foresters, requested approximately 71 fire managers and specialists. Although final details of the arrangement are being worked out, the contingent from Australia and New Zealand is expected to arrive in Boise, Idaho on August 23 for a one-day induction to learn about current fire behavior, fuels and weather conditions. Upon completion of this orientation, they will be assigned to large fires that are currently burning. The request includes 15 Division Supervisors; 15 Task Force/Strike Team Leaders; 15 Helicopter Managers; 10 Heavy Equipment Bosses; 10 Safety Officers; 4 Regional Liaison Officers; and two National Liaison Officers. Fifteen of the total are from New Zealand. Assistance from Australia and New Zealand is a good fit primarily because their fire organizations are very similar to the United States national fire organization in training requirements and structure. Large fires are continuing throughout the West, particularly in the Northwest, Northern Rockies, Northern California, Southern California and Great Basin Areas. Approximately 93 uncontained large wildfires are currently burning on more than one million acres in Oregon, Washington, Idaho, Montana, California, Nevada, Texas and Arizona. The National Preparedness Level remains at 5, the highest level, indicating a high level of wildfire activity and a high level of commitment of available wildfire suppression assets, such as firefighters, aircraft, and engines. Weather and fuel conditions are predicted to continue to be conducive to wildfire ignitions and spread for the next few weeks. 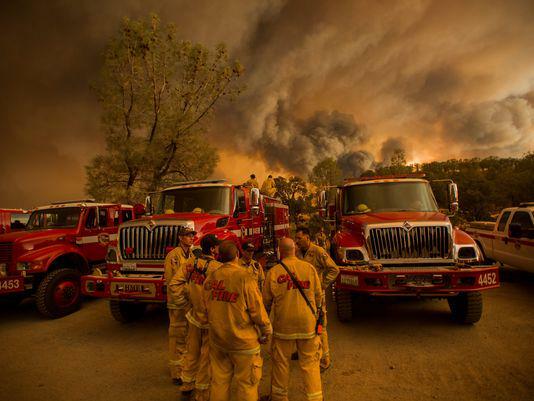 In 2008, the last time Australia and New Zealand firefighters assisted the U.S. with wildfire suppression, 49 fire managers and specialist spent 37 days in California. The time before that was during the 2006 fire season when 120 firefighters from Australia and New Zealand came to the U.S. to assist with efforts in the West. Prior to that, they have also assisted during the 2000, 2002, and 2003 fire seasons and U.S. firefighters traveled to Australia to assist with their fire seasons in 2010, 2009, 2007 and in 2003. In addition to the Australia and New Zealand support, Canadian firefighting assets are currently assigned to the Northern Rockies Geographic Area. Five wildland fire suppression crews from Ontario, Canada and one Convair 580 airtanker group from both Saskatchewan and Alberta are supporting fire suppression efforts in Montana and northern Idaho.